This test appears to be limited to the Android app, which is common when tests like these are spotted in the wild. Facebook is taking a page out of Reddit’s playbook, who lets its community moderate itself to a certain extent with upvote and downvote buttons. What puzzles me about this screenshot is that the comment with zero upvotes is placed above the comment with two upvotes. On other platforms, a comment with the most upvotes is sent to the top, since it’s an indication that users think the comment is valuable to the conversation. Conversely, downvoted comments are sent to the bottom. But that’s not what’s happening in this instance. Then again, it’s just a test at this point, so maybe Facebook is still working on that functionality. This is certainly a more diplomatic solution to moderating comments, as opposed to outright deleting them. Although I’ll hazard a guess that Facebook will still let pages delete comments if they wish. Upvote and downvote buttons can also help pages that get so many comments they don’t have time to read each one. Users can do the work for them by demoting “uncivil or irrelevant” comments. This feature has the potential to greatly improve the quality of pages’ comment sections. Time will tell if it ends up rolling out publicly. An improved version of Ads Manager is being released now, with an updated Business Manager coming later this year. Facebook has begun rolling out a simpler version of the Ads Manager interface. Those who have access to the revamped interface will see a new navigation bar, which offers users more space to manage ads. The new navigation bar also highlights tools that offer more insight into ad performance and reporting. Facebook is updating the campaign creation experience with a new copy and paste functionality. It’s said to offer more flexibility when building ads. An auto-naming feature will allow businesses to customize their campaign, ad set, and ad names even faster. Lastly, more intuitive ad-level creative and placement editing tools are being planned as well. These updates are rolling out now and are expected to be available to everyone by next year. Facebook plans to update Business Manager to let agencies activate their clients’ campaigns faster than before. An easier way to assign and organize assets to people. There’s no timeframe for when the updates to Business Manager will be available, Users can expect to see it sometime later this year. Users now have more insight into how past interactions on Facebook impact the ranking of posts in their news feed. This is the first time Facebook has built information directly into the app on how news feed ranking works. Users can access “Why am I seeing this post?” from any news feed item using the drop-down menu in the right-hand corner. Why a certain post is being displayed in the news feed — for example, if the post is from a friend, a group the user joined, or a page they followed. The popularity of the posts shared by the people, Pages, and Groups you follow. Shortcuts to controls, such as See First, Unfollow, News Feed Preferences and Privacy Shortcuts. Facebook is also providing users with more insight into the ranking of paid posts with an update to “Why am I seeing this ad?”. You can now discover additional details about ads shown when information on an advertiser’s list matches your Facebook profile. Previously, “Why am I seeing this ad?” showed how demographic details, interests, and website visits contribute to the ads displayed in the news feed. Another way to target users with advertising is to upload existing information such as email addresses and phone numbers. Going forward, “Why am I seeing this ad?” will now indicate when the advertiser uploaded the information or if the advertiser worked with another marketing partner to run the ad. Marketing on Facebook isn’t a free-for-all. It’s not a guaranteed win, either. (Organic reach on Facebook has notoriously plunged downward in the past few years – reaching your audience for free is pretty much in the past). But, before you can ever make a blip on the Facebook algorithm, you need to follow some basic rules. These are outlined in Facebook’s policies, but they can be hard to weed through, and often it’s unclear which guidelines pertain to marketing tactics. That’s why I’ve pulled together this guide to clarify the most basic rules. If you’re in violation of any of them, your page could get shut down – a worst-case scenario. Avoid that situation and make sure your marketing complies, including giveaways, contests, posts, and ads. A note informing any participants that their entry in your promotion also releases Facebook from any responsibility or liability. A note that acknowledges Facebook has nothing to do with your promotion. Basically, this guideline makes sure your entrants know your promotion has zero connections to Facebook, other than serving as the platform where you’re hosting it. There are no good excuses for not including these two pieces of information with your giveaways, contests, etc. All you have to do is include a small note following your promotion’s rules and guidelines. Another basic guideline for posting promotions on Facebook: Don’t use personal timelines to do it, and don’t require entrants to use friend connections to enter. Tag a friend to enter the promotion or gain additional entries. Share the promotion for additional entries, either to a friend’s timeline or on a personal timeline. Note that you still may encourage participants to share your promotion – you just can’t make sharing or tagging requirements for entry. This kind of transparency is not just a Facebook policy; it’s also a best-practice for doing business, period. Don’t use grammar or punctuation that’s excessively incorrect (i.e., if your brand name is an intentionally misspelled word or includes one intentional grammar error, that’s fine, but going overboard might get you in trouble). Example: ipsy’s page name is spelled with a lowercase “i” and passes muster. If, on the other hand, their page name included a grammar error, too, it probably wouldn’t be acceptable. Don’t use generic terms or locations – for instance, if you sell necklaces, your page name cannot be “Necklaces”. If your brand name falls under any of these no-no’s, you might want to go back to the drawing board – and not just for Facebook, but for general branding success. Does your business offer marketing services, including social media marketing? If so, you might need to mention the Facebook brand in your ads and posts. Specifically, when you post ads mentioning Facebook on Facebook, there are rules for that, too. You can mention Facebook in a limited way. “Facebook” should always appear in the same font/size/style as the text surrounding it. Always capitalize the brand name “Facebook” – don’t make it plural, don’t abbreviate it, and don’t use it as a verb. Don’t substitute the Facebook logo for the word “Facebook” in your ad copy. Don’t use the Facebook logo in your ads. Facebook gives brands options for adding CTA buttons to their pages. However, if you provide a call-to-action on Facebook, there are rules for that, too. Particularly, Facebook stipulates that, after a user clicks your CTA, any information you obtain from that interaction can’t be used for any other purpose than providing the service the CTA promised. If you want to use the information you obtained from a CTA click in any other way, you have to get the user’s consent. 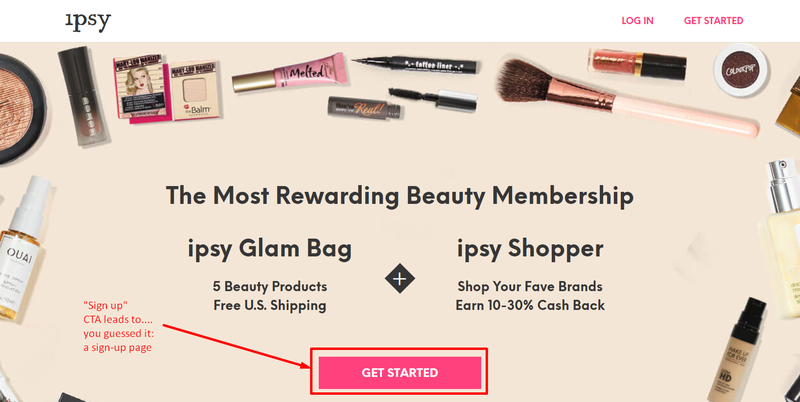 For example, the CTA on ipsy’s business page encourages you to sign up for their subscription service. When you click the CTA, it takes you to a sign-up page. If the CTA took you to a survey, that would be misleading, and the information you collect would not relate to that “Sign Up” action. This is perhaps an example of poor marketing practices more than anything else, but it’s also a clear violation of Facebook’s policies. Misleading CTAs are never okay. If your CTAs aren’t crystal-clear or point to unrelated pages, you need to go back and refresh yourself on CTA etiquette. Keeping up with Facebook’s policies and complying are the best ways to make sure your pages stay in the light. Another reason to do it? Facebook’s policies align with basic best practices for online marketing, including transparency, honesty, and respect for the user. Keeping up with them isn’t just about abiding by the rules – it’s also about being a trustworthy marketer. That’s definitely a worthy goal. The problem is users are not receiving text messages from Facebook which they need to verify ownership of their accounts. Joe Youngblood, one of many users currently locked out, has been documenting the process of trying to regain access to his account. Today is day 15 of not being able to access my Facebook account. In today’s world this could cripple a small business and make them close shop. There is no excuse for not being able to help people locked out by a broken 2-factor process @fb_engineering you NEED to fix this! Despite many attempts of reaching out to Facebook about this issue, he has not received any help. As mentioned, he’s not alone. With a quick search for “Facebook SMS” on Twitter you can find many other users locked out of their account for the same reason. The faulty SMS two-factor authentication problem appears to be severely underreported even though it’s impacting users worldwide. In an effort to raise awareness of the problem, Youngblood created the Twitter account @FacebookSMS2FA which contains a growing collection of retweets from users who are locked out of their accounts. This problem could be especially detrimental for people who rely on Facebook to run their business. For what it’s worth, Youngblood has a long-term history of buying Facebook ads, and that has not seemed to make a difference with regaining access to his account. What’s also notable about this issue is that Facebook was in the news earlier this month for allowing users to be found using the phone number provided for two-factor authentication. So not only is Facebook misusing users’ phone numbers, but it’s not even living up to its end of the deal by providing secure and reliable two-factor authentication. With more users speaking up about the problem, will Facebook finally do something to correct it? We’ll have to wait and see. Facebook is expanding its Ad Library tool to include information about all active ads from any page. Previously, Ad Library only included information for ads related to politics or issues of national importance. It was also limited to searching by keywords. Now you can search by page. In addition to finding all ads a page is running, you can also see details about total impressions, who saw the ad, and how much was spent on it. Ad Library contains information about ads across all of Facebook’s platforms. Here’s an example showing what I found when searching for ads that Google is running. As you can see, there’s a drop-down menu to filter ads by country. Ad Library will also point out when an ad is dynamic and has multiple versions. Be sure to make your searches count when using Ad Library. Apparently, you can get locked out for conducting too many searches in a short period of time. All of the above information will be available within a new “Page Transparency” section on Facebook pages. Previously, you had to click “Info and Ads” to find this information. With this update, Facebook is making improvements to the Ad Library Report as well. Reports will be downloadable for everyone.